1. First make the chocolate mousse: pour the cream into a saucepan and bring to the boil, then remove from the heat, add the chocolate to the cream and stir the mixture until the chocolate melts. Add the grated orange zest or orange liqueur/brandy and whisk in the egg yolks. 2. In a separate, clean, dry bowl, whisk the egg whites until just stiff, then stif a quarter of the egg whites into the cream mixture. Gently fold in the rest of the egg whites, then spoon into little bowls, glasses or cups and leave for 2 hours in the fridge to set. 3. Next, make the shortbread bistuits. Preheat the oven to 180°C/350°F/gas mark 4. 4. Mix the flour and sugar together in a large bowl. Add the butter and rub it in, bringing the mixture together to form a stiff dough. (There will be enough butter in the mixture to bring it together, so don't be tempted to add any water.) Alternatively, briefly mix all the ingredients in a food processor until they come together. 5. Transfer the dough to a work surface lightly dusted in flour and roll it out to a thickness of about 5mm (¼ inch). Cut into shapes - fingers, rounds or whatever shapes you like - and place on two baking sheets, spaced evenly apart. Put in the oven and cook for 6-10 minutes or until pale golden in colour. 6. Remove from the oven and, using a palette knife or metal fish slice, carefully transfer the biscuits to a wire rack to cool. 7. 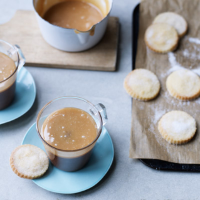 For the salted caramel sauce, place the sugar in a saucepan with 75ml (3fl oz) of water and set over a medium heat, stirring the syrup as it heats up to dissolve the sugar. Once the sugar has dissolved, stir in the butter, then turn the heat up to high and cook for about 10 minutes or until the mixture turns a toffee colour. Do not stir the mixture as it cooks, though you might need to swirl the saucepan occasionally if you see the caramel turning golden on one side of the pan before the other. 8. Once the caramel is a rich golden toffee colour, take it off the heat for a moment and stir in half the cream. When the bubbles die down, stir in the rest of the cream and salt to taste. Serve with the chocolate mousse and shortbread biscuits.